By Polaroid. Stores reference 22c/882. Intended for use when flying over water surfaces and under severe reflected-glare conditions. They provided an excellent filter for use in submarine spotting and coastal reconnaissance. 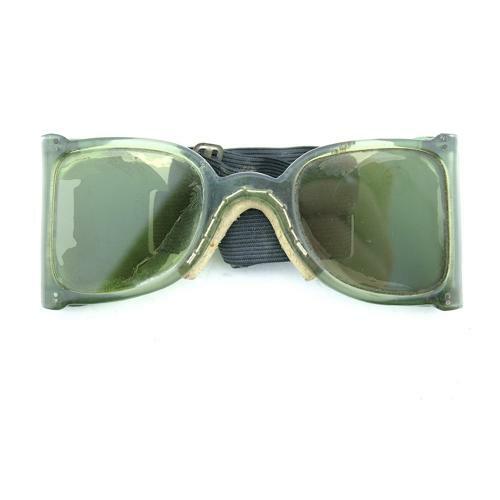 The frame is made of light green tinted moulded acetate in one piece, having two semi-circular side-shield attached with nickel plated hinges. A chamois covered sponge nosepiece is stitched to the frame and the spectacles are fitted with a simple adjustable black elastic strap. The lenses are laminated Polaroid safety glass. The frame looks good but there is a small repaired crack ot the left of the nose (as viewed from the front. This doesn't really detract and will appear worse in the photographs. All of the hinges are good, tight and function well. As with most pairs found, the lenses have delamination marking although this isn't too bad and largely confined to the edges. The headstrap is lightly soiled but in very good order and retains much of the original elastication. The adjustment buckle has surface corrosion. The nosepiece is complete and has light soiling only. Air Ministry marked with reference numbers, all engraved into the sideshields. The MK.VI series were not produced in large numbers compared to other goggles and spectacles and are now quite rare to find. Stock code G22099.